But in the intervening years, and we must be perfectly frank about these things, there has been a development of thought, until today I doubt very much whether you would get many prominent bankers to attempt to deny that banks create it. - Are Goldman Sachs and The Megabanks Able to Wipe Out an Entire Economy With a Keystroke? 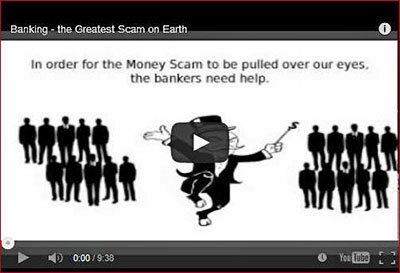 - Are The 'Banksters' Wrecking The Global Economy Through The Trilateral Commission? - Are We About to See a "European Monetary Fund?" - Bank Transfer Day - Successful! - El Dinero Sucio - de "Los Dioses del Eden"
- El Dinero Sucio Se Hace Internacional - de "Los Dioses del Eden"
- Euro vs. Dollar - Sideways, But for How Long? - Farewell to Dollar Supremacy. - Financial Suicide - Will The U.S. Be Unable to Pay its Bills? - Funny Money - from "The Gods Of Eden"
- Funny Money Goes International - from "The Gods Of Eden"
- Greece - Dump The EU Now For An Economic Recovery! - Is An Economic Deluge Nigh? - Is Greece The First Domino Toward Widespread Banking Panic and Currency Controls? - National Infrastructure Bank - Another Trilateral Ripoff? - No te Dejes Engañar - Este es el Objetivo Final de los "Papeles de Panamá"
- Politicians Work for Banks - Despise The State, but Even More The Banks! - Shocking Revelations About Wall Street's "Secret Government"
- Spain Braces for its Biggest Corporate Insolvency… Ever! - The History of The "Money Changers"
- Warning - Get Your Money Out - "All Legal Bank Deposit Protections Are Now Officially Gone"
- Was Dominique Strauss-Kahn Trying to Torpedo The Dollar? - What Is Money Reform? - A New Breed of Rough Riders? - Dollar Issuance by The United States Is "Out of Control"
- Are Black-Budget Ops Stealing Their Money from The Stock Market? - Color Revolutions - Argentina Next? - Currency Warfare - What are the Real Targets of The E.U.? Oil Embargo Against Iran? - ¿Es el Banco Suizo UBS el Caballo de Troya del Fisco Estadounidense? - Government to Spy on Everyone Who Banks in The U.S.
- Response to "Why Isn't the Stock Market Collapsing?" - The History of Banking - Where Did King Solomon's Treasure Go? - The Sting - Mr. Johnston's Letter to his Sons! - Titanic Battle or Insider Trading? - The S&P Downgrade and The Bilderbergers - All Part of The Plan? - UBS Issues Hyperinflation Warning for U.S. and UK - Calls It Purely "A Fiscal Phenomenon"
- Who is Behind the Oil War, and How Low Will the Price of Crude Go in 2015? - Why are Banking Executives in London Killing Themselves? - Why Does the SEC Protect Banks' Dirty Secrets? - Ushering in a Totalitarian Police State in Cashless "Smart Cities"
- War on Cash ALERT in the EU - Now Pushing "Restrictions on Payments in Cash"
- Are Central Banks Losing Control? - Central Bank of Central Banks Says "The World is Unable to Fight Next Global Crash"
- Guess How Many Nations in the World Do Not Have a Central Bank? - ¿Estamos al Borde de un Reset Financiero Global? - Siamo al Limite di Un Reset Finanziario Globale? - Top CEO Warns of Global Reset - "It's in The Cards for Sure… It Could Happen this Year"
- El Colapso Económico - ¿Qué Ocurrirá a Partir de Ahora? - Global Debt is More than Twice as Big as the Entire World Economy… - What Does It Mean? - Grecia, China... ¿Estamos al Inicio de un Colapso Financiero? - ¿Ha Llegado el Momento del Colapso Económico? - Hard Evidence - "We are In a Full Blown Global Depression"
- How do You Know when Your Society is in the Midst of Collapse? - Is this The Most Terrifying Interview of 2015? - Markets Are Sick - Medic! Medic! - ¿Qué le Espera a las Monedas Latinoamericanas en los Próximos Días de Enero 2016? - "Se Acerca una Gran Catástrofe y Sólo se Salvarán los que Tengan Oro y Tierras"
- The End of Tax Havens? - Global Debt Crosses $100 Trillion, Rises by $30 Trillion Since 2007 - $27 Trillion is "Foreign-Held"
- Global Debt is Now an Insane $164 Trillion but, Who Exactly Do We Owe? - La Estafa de La Deuda - de "...Y La Verdad Os Hará Libres"
- Are the Banksters Creating their Own Cryptocurrency called 'Utility Settlement Coin'? - Calls for a New Global Currency Accord - What About the Existing One? - Dollar Strong... Compared to What? - Goodbye Petrodollar, Hello Agri-Dollar? - Planes Globales Para Reemplazar Al Dólar - El Ocaso de EE.UU. - Will The Chinese Renminbi Replace The U.S. Dollar as The Primary Reserve Currency of The World? - How Does the Blockchain Work? - The Venezuelan "Petro" - Towards a New World Reserve Currency? - Virtual Currencies - Gold 2.0 or Mirage? - When is The Government Going to Shut Down Bitcoin? - Is the New BRICS Bank a Challenge to U.S. Global Financial Power? - What Is Offshore Private Banking? - A Pogrom of Offshore Companies or Operation "Offshore Leaks"
- Life and Debt - De Como el FMI Ayuda a "Mejorar la Vida"
- The Shocking Truth of The Pending EU Collapse!